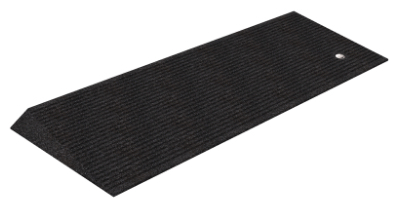 For safe, smooth ground-to-sill transition that's easy to install, we recommend these rubber beveled threshold ramps. Both scooter and wheelchair users can benefit from these handy ramps, which are made from 100% recycled tire rubber to decrease your carbon footprint. Made to clear 1.5-inch tall obstructions. Combine with our rubber threshold risers for added height! Save even more by buying two at a time.